Every sector needs an idol; a doyen to look up to. Chandra Thomas Adolphus Schaffter is that icon, for the insurance sector in Sri Lanka. Often referred to as the ‘Father of Insurance’ in Sri Lanka (a title he modestly shrugs off), Schaffter stands tall with his imposing stature and signature silver locks. 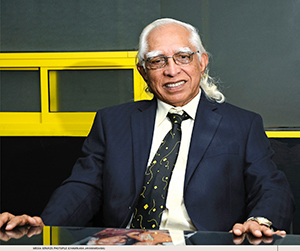 Despite spending six decades in the insurance sector, the octogenarian remains actively involved in nurturing the company he established in 1994 – today, Janashakthi Insurance is amongst the leading insurance firms in the island. Although he has shed his official role in the company, Schaffter remains a fountainhead of experience for employees of Janashakthi Insurance, and is clearly a much-loved figure. His down-to-earth demeanour and self-confessed adept man-management skills have helped him attract some of the brightest talent in the field of insurance, whom he has personally nurtured. Having worked his way to the top, after commencing his career as a clerk at Ceylon Insurance (that was at the age of 22), he counts an enviable knowledge of what makes the world of insurance tick. At the age of 42, Schaffter abandoned the safety of a steady job, to become an insurance agent. It was a move that motivated him to test his personal and professional mettle. The outcome was nothing less than favourable, and he soon established his credentials as a leading insurance agent in the country. In 1979, he was the only individual to be appointed Principal Agent of National Insurance. He set up a successful insurance consultancy business in Chennai, too. In 1979, Schaffter was requested by the then government to provide a blueprint for the setting up of a subsidiary corporation that would lead to the liberalisation of the insurance sector. The state established the National Insurance Corporation (NIC) on the basis of his blueprint. Later on, he was also closely engaged in setting up CTC Eagle Insurance, in collaboration with Eagle Star of the UK. Schaffter presented a path-breaking paper in 1986, on the invitation of the then Finance Minister, which served to bring about an end to the 18-year state monopoly and opened the floodgates for private insurers to enter the sector. He was the architect of the proposals for this vital and groundbreaking reform. His contribution to the insurance sector is phenomenal. Apart from voicing his views fearlessly on various regulations affecting the sector, Schaffter has also pushed for the development of the sector, by way of his involvement in many forums and committees. He was feted with the prestigious Lifetime Achievement Award, at the 16th Asia Insurance Industry Awards 2012. 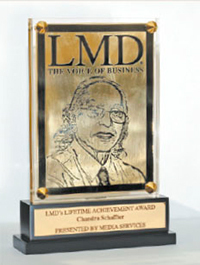 Three years later, LMD’s Lifetime Achievement Award goes to him. Another landmark career achievement was the acquisition of National Insurance, one of two state sector insurance firms. However, his professional path was not always smooth sailing, as Schaffter faced many personal setbacks, with vested interests reportedly attempting to sabotage his company’s progress. His only other love, besides insurance, would be cricket. Schaffter represented the Tamil Union Cricket and Athletic Club for many years, and also captained the club. He represented Sri Lanka in cricket and hockey, and was the first Sri Lankan President of the Mercantile Cricket Association, back in 1965 – a domain hitherto monopolised by Europeans. In addition, he was the Manager of the Sri Lankan cricket team, on its first-ever tour of India and on three subsequent stints – in 1991, 1999 and 2002. And in 2002, he led a Janashakthi cricket team which featured Muttiah Muralitharan, to war-torn Jaffna. The doyen is not entirely happy with segregation of insurance into life and non-life segments, and feels this law has single-handedly weakened the sector. That said, he foresees many opportunities for growth and hasn’t lost his competitive streak, wishing for Janashakthi Insurance to lay claim to the top spot in insurance. Schaffter’s hope for his country is that its people could live in peace, without harassment and injustice. He prizes the affection that his staff holds for him, and hopes that they will carry the torch for Janashakthi, as a business that is ethical and upholds the highest standards. He has chronicled his thoughts and experiences in My Sixty Years in Insurance – a record of the challenges, achievements and failures that marked his illustrious and inspiring journey, to be considered one of the pillars of Sri Lanka’s corporate heritage. Chandra Schaffter was born on 3 April 1930, in Colombo, into a family of five sisters, but was orphaned at an early age. Schaffter schooled at S. Thomas’ College, where he wore the school colours as captain of the cricket team and head prefect. He left school in 1950, and entered the medical faculty of the University of Ceylon, but discontinued his studies to step into the world of insurance, in 1952. Chandra Schaffter has three sons, a daughter and 13 grandchildren. All his children are engaged in the family’s diverse business interests, which span insurance and finance. Schaffter lives and breathes insurance in every waking moment! He admires former prime minister Dudley Senanayake (as a man of integrity); and Mahatma Gandhi and the ex-president of India Abdul Kalam (for their upright principles).